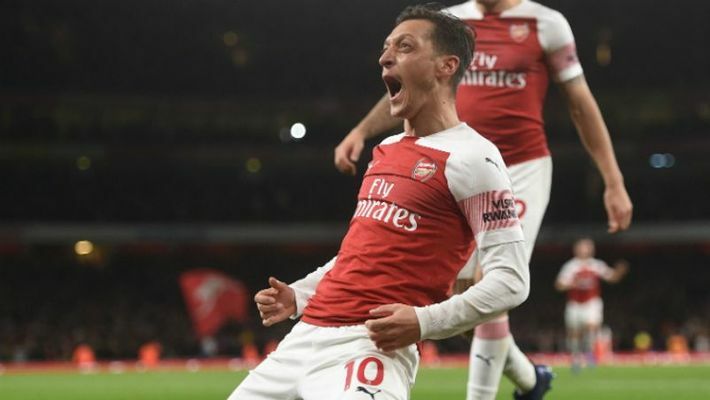 London: The brilliance of Mesut Ozil and Pierre-Emerick Aubameyang kept Arsenal rolling along on Monday. "We are beginning to play with heart," first-year Arsenal coach Unai Emery said. "When you continue to improve your demands are very high. We need to control the matches more than we are doing now. First half we didn't play well but then we played with quality and heart. This feeling together is very good," he added. Leicester made a good start and was rewarded in the 31st minute when Ben Chilwell charged down the left side and sent a shot which deflected off Hector Bellerin and past goalkeeper Bernd Leno. Arsenal then started to take control and equalized just before halftime when Ozil made a run from the midway line, passed to Bellerin on the right and side-footed the defender's quick return off the inside of the far post. Though Arsenal carried the momentum into the second half, it was Leicester which almost regained the lead as Wilfred Ndidi's header hit the crossbar. Aubameyang then came off the bench and needed just three minutes to make impact as he tucked home a cross from Bellerin, who had been released down the right side by Ozil, in the 63rd minute. Arsenal then wrapped things up three minutes later with Ozil at the center of a brilliant team goal . The German let a pass from Bellerin go through his legs to Alexandre Lacazette and continued his run into the area. Lacazette slid a perfect ball back into Ozil's path and he crossed for Aubameyang, who easily tapped home at the far post. "I do not have to tell you how good a player Mesut Ozil is, he has shown that," defender Shkodran Mustafi said. "When you give him the opportunities in his favorite position behind the striker, he has the capability of doing everything - making goals and scoring. He can make us look very dangerous going forward."